We have had a lot of people asking how they can tell if they have the Fall Creators Update installed. Well it’s really easy. If you see Version 1709, you have the Fall Creators Update installed. This version was released on October 17, 2017. If you see Version 1703, you are using the Creators Update and Fall Creators Update is not yet installed. 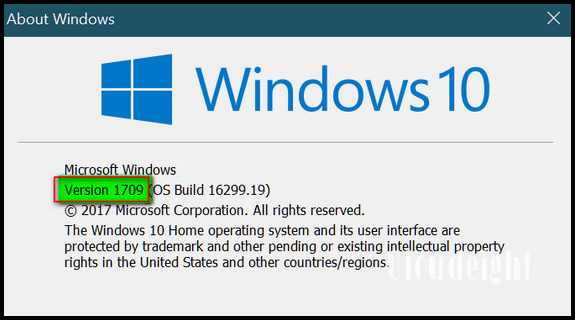 Version 1703 (Creators Update) was released on April 5, 2017 – and the roll out began via Windows Update on April 11, 2017. If you see Version 1607, you are using the Anniversary Update. This update was released on August 2, 2016. If you see Version 1511, you are using what is known as the November update. If you’re using this version you are no longer getting security updates from Microsoft. This update was release on November 12, 2015. If you see Version 1507, you are using the very first release of Windows 10. It is out of date and you’ll no longer receive security updates. Version 1507 was released on July 20, 2015. Any version of Windows 10 can be updated to Fall Creators Update. Those using Windows 10 version 1703 (Creators Update) will get the update (eventually) automatically via Windows Updates. Those of you using older versions of Windows 10 can update manually by following the instructions on this page.